Cooking is fun, children can learn so much from cooking activities such as developing their fine motor skills, learning the language from the recipe, inquiring math and science concepts by using the measuring tools, and getting a sensory experience for their five senses. These are the skills that we practice in cooking activities once we think about it, but what else can we get from this activity? How can we fully utilize this opportunity to unfold the learning possibilities in different domains? As a big fan of cooking with children, I see it as an opportunity to develop collaboration among parents, teachers and children. All children have prior knowledge of cooking before they enter school. 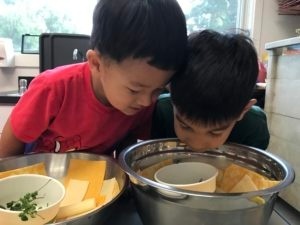 They either observed how their parents did it or had experienced doing it with their parents, therefore, it’s a great way to use this link as a home-school connection and to welcome parents into the classroom. 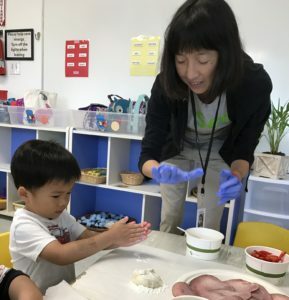 Parents get a chance to experience an activity with their children and develop a greater understanding about how children live and learn in the classroom. And by getting feedback from parents, teachers can improve to better meet children’s interests and needs. At the end, children can receive a consistent learning experience. By incorporating foods from the cultural heritage of the families, we can create a concrete diversity experience. 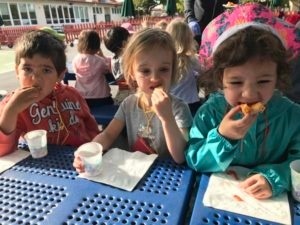 By introducing to children to food from different cultures, they can see a bigger picture of the community they live in, and they also become more open-minded as they taste different foods that their friends eat at home. Who says eating is not risk taking? It definitely takes a lot of courage for children to eat things that they are not familiar with. Cooking activities also teach children to be thankful. Through the process of cooking, children see how each ingredient, with people’s effort, can becomes a delicious product to eat. I hope that by experiencing this process, children will have more appreciation of the food that people made for them everyday. In cooking, children will learn how to safely use different cooking utensils. To take it further on safety, teachers can discuss with children about food allergies and how we can protect ourselves and our friends from staying away from food that may cause an allergic reaction. We take this opportunity to share the pizza with our Nursery 2 buddies in the afternoon. 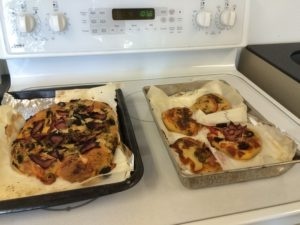 Children felt really excited that their buddies liked the pizza, and it’s really a good start of friendship building. This is our first gathering with our buddies and we will continue to have more throughout the school year.